Tom Finney would have been great in any team, in any match and in any age… even if he had been wearing an overcoat. To dictate the pace and course of a game, a player has to be blessed with awesome qualities. Those who have accomplished it on a regular basis can be counted on the fingers of one hand – Pelé, Maradona, Best, Di Stefano, and Tom Finney. If you’re as good as Tom Finney was, you don’t have to tell anybody. Sir Tom Finney was one of the greatest footballers there has ever been; he was the type of player that people would travel a long way to see. He’s a great man and has contributed so much to football, especially in the Preston area. They love him there. I’m a good personal friend of Tom’s and he is very well liked in the game. He was a fantastic player – one of the world’s top players without question. My first experience of Sir Tom Finney is not one of joy – as I stood on the terraces of Hampden Park and watched him giving one of my heroes in the Scotland team, Sammy Cox, a roasting. Winding forward all these years and actually meeting the man restores any lost faith you might have in humanity as he is such a wonderful person and so humble. Why can’t we all be like that? A credit to the town of Preston, his football club and his family – well done, Sir Tom. Sir Tom was a great help to me in the early stages of my management career. He has an incredible passion for the game and he is somebody I have got great admiration for. There is no doubt he was one of the greatest players, but to me he is also a great man. I am delighted to have the opportunity to pay tribute to Sir Tom Finney. He is remembered around the world as one of the greatest players in England’s history. I am told that at one time, after helping England to beat Italy 4-0 in Turin, Sir Tom was offered the chance to play club football in Italy with Palermo. He chose to stay with his hometown club in Preston and I am sure that was a loss to Italian football but a big gain for supporters in Preston and England. If ever a man deserved such an honour [his knighthood] it was Tom, not only for his football prowess but for his way of life and everything that matters to a footballer. I’m delighted for him. I played football with Tom Finney for ten years in the Preston North End team and it was a pleasure to play football on the same pitch as the man. I was bad but he made me look good. He made my bad passes look great. Because of Tom everybody thought I was a good player. He was a fantastic player – the greatest I’ve ever seen. It wasn’t very nice playing against him though, I’ll tell you. We played against each other in Scotland v England games of course, and I could never catch him. The only time I got near him was in the tunnel before the game, and even then he was too fast for me! If Tom was ever tackled unfairly you never heard him complain or retaliate. He was a gentleman on and off the field and an inspirational captain. I became a much better player watching and listening to him. His enthusiasm for the game never wavered. He had a genuine love for football. He was justifiably honoured by Her Majesty and affectionately known to everybody as ‘Sir Tom’. That Sir Tom is regarded with respect and great affection is not surprising. To me, and all Preston North End managers, he was consistently supportive, never voicing criticism. Premier League managers would salivate at the prospect of such talent and Tom would be able to name his price – something he resolutely refused to do as he gave unstinting service to PNE. Tom Finney was a great player to feed off; he had amazing ability, especially for a 34-year-old plumber. He was strong-legged, full of spring, good in the air, very talented but also naturally gifted. Tom was a master of all conditions, in that he could perform on any surface. Some of the pitches we had to play on in those days, compared to today’s excellent ‘carpets’ – it makes you shudder to think back. In retrospect, Tom was probably over used by the club, playing for the cause when not fully fit. The trouble was he was a huge asset to the club, putting thousands on the gate if he played. Sir Tom was one of the greatest footballers of the 20th Century. He was one of only a small number of players who made his England debut before he had made a full league debut for his club. Tom was always willing to give his autograph. You can imagine how I felt, having been successful with the town schoolboy team and Lancashire schoolboys and having had a trial for England, I was approached by a number of clubs, including Preston North End when Cliff Brittain was the manager and George Barge was the scout. Myself, my dad and my uncle were invited over to Preston for Sir Tom’s last game, against Luton Town. Imagine my utter delight when the manager went into the dressing room and brought Sir Tom out to meet me. On probably one of the most emotional days of his career, he took the time to have a good chat with me about professional football and wished me all the best. Such a meeting left an indelible memory for me and summarised Sir Tom perfectly. Even though he was the biggest star in the game he always had time for everybody including the latest new recruit.I consider it one of the finest privileges of my life to know Sir Tom and to be able to pay tribute to his great qualities and the fact that he has always been willing to support the Professional Footballers’ Association. 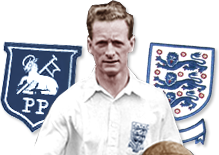 Finney’s name is revered today because of his loyalty to Preston North End and his 30 goals in 76 England internationals between 1946 and 1958. And for so much more. Finney will forever be associated with fair play, for showing respect to an opponent, for dignity. The true sporting greats are blessed with grace. Modesty should be Tom Finney’s middle name. Anyone talking to Sir Tom about his contribution to those halcyon post-war days will find him directing praise elsewhere, to those other characters who made the England dressing room such a special place. I made a point of going to watch Mr Finney whenever North End came to London. Every minute was a privilege. It is safe to assume that the cloth-capped multitude, who saw Tom Finney play 433 matches for Preston in the 15 years from 1946 to 1960, scoring 187 goals along the way, felt the same. When I first saw him, I wrote warmly of the qualities of young Finney and I wanted to see how right I was in that judgment. My thoughts were fully warranted and I repeat that he has the makings of the finest outside-right I have seen since Stanley Matthews. The boy’s gifts are those of a ripe, experienced player. He doesn’t yet know of course how always to apply them to the maximum advantage. That will come with experience. He can slip like an eel between two opponents, with the ball under perfect control. What is quite uncommon is his sense of timing, which is always the difference between the good player and the star. His left foot is refreshing. We shall hear more of Finney, that I am sure. When Palermo were interested in him, Tom was sent for by the Chairman, Mr Taylor. He said “Tom, Palermo are interested in you – go home and discuss it with Elsie and see me on Monday”. Tom went home and discussed it with Elsie and went back to see Mr Taylor on Monday. Tom knocked on the door and walked along the Long Room and stood before the Chairman.”Mr Chairman” said Tom. “No, Mr Chairman” replied Tom. “Well the job will be no good to you, Tom” said Mr Taylor. “I will have to tell them ‘no’”. And that is just a small insight of the great man. Tom, you made fans of all of us who were privileged to see you play – thank you for that. It was because of Tom Finney that I first got properly interested in football. I was a young lad in East Lancashire, maybe 11 or 12, when Tom began making a name for himself. I kept reading and hearing about his exploits and wanted to know more about him. I would never have believed that a few years later I would be lining up alongside him for England. He was the complete footballer; a wizard of a winger and a tenacious centre forward all in one. The greatest footballer of my lifetime. He was the best. There isn’t a lot I can say about Tom which hasn’t already been said. He was the finest winger I ever played with and it was a real pleasure to appear in the same team as him. With Finney in the team we always had a chance despite being up against it sometimes. I shall never forget the majestic performance of Tom Finney in overcoming conditions which would have sent many superstars I have known scuttling home to their mummies. Stanley Matthews and Tom Finney were the two finest wingers I ever played against. Each were geniuses, and of the two I reckoned Finney the more dangerous. Tom is synonymous with Preston North End and his loyalty to one club will probably never be repeated. All of us who support Preston North End should be proud and humbled to have Sir Tom as our president. I will never forget the support you have given me in my years as chairman and the friendship we have had for many years. You have been great ambassador to the game of football and a true and loyal servant for Preston North End. On behalf of The Football League and its member clubs, I would like to wish Sir Tom a very happy 90th birthday. A wonderful ambassador for Preston North End, The Football League and English football as a whole, Sir Tom was the epitome of a model professional. A one-club man, his dedication and love for Preston has never wavered and he continues to proudly represent the club and the City today. Sir Tom, you are a true Football League Legend. Many happy returns and I hope you enjoy your special day.